First: I liked it a lot. Second: Yes, fine, everyone is right: you really should read Hugh’s story, Iron and Magic, before reading Magic Triumphs. It’s not absolutely crucial, but it certainly works better that way. For one thing, if the reader hasn’t followed Hugh through his redemption arc, that probably seems a bit iffy; and for another, Elara and Hugh are more settled in their relationship by the time we see them in Magic Triumphs and it’s nice to understand how they got that way. Third: You know, I think Roman is perhaps my favorite secondary character? I didn’t realize that until this book, although honestly I think I fell in love with him in the previous book, Magic Binds. The idea of having the priest of the black god officiate at your wedding is so much fun, and Roman is so determined to make sure the wedding goes well, no matter what kind of disaster is looming or how utterly indifferent Kate is to the details. Roman is great in Magic Triumphs as well, though his role is smaller. Fourth: It is absolutely priceless when Erra and Hugh sit down with Roland to sort out their tactics for their huge climactic battle, and Hugh winds up drawing little stick figures to get the idea across to Roland. I really enjoy how Roland, for all his power, is really not that smart and certainly not a tactical genius at all. Fifth: The resolution worked pretty well. It was plainly going to be tricky to sort things out without having Kate dead at the end. I do wonder how far in advance the authors worked out exactly how they were going to do that? Plainly they had it set up in Iron and Magic, but perhaps not before that. Sixth: I didn’t see that thing coming with Curran, but it was a pretty nifty deus ex machina moment. Um, so to speak. I’m not one hundred percent sure that Kate wouldn’t have figured that out beforehand. Though I grant, she was pretty distracted. Now I’m re-reading Magic Binds. 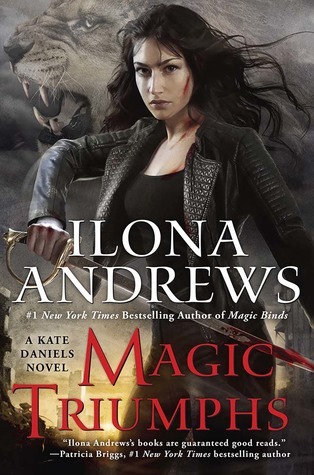 I think I’ll work my way backward through the series for a couple of books and then perhaps read Magic Triumphs again. I think it made sense that Kate didn’t connect those dots, because she’d been so fixated on the idea that one or the other of them would die that she stopped being able to see the possibility of non-tragic outcomes. We, as readers, know they’ll get a happily ever after, so we can work backwards from that to figure out how Curran’s stuff fits in.